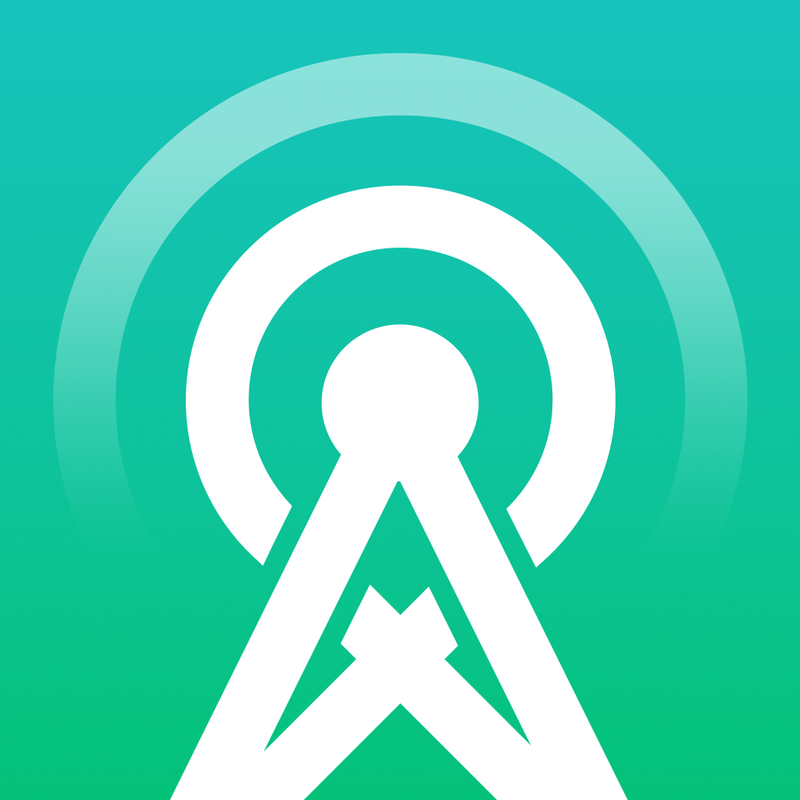 Mocast ($2.99) by Krueger Systems, Inc. is a different and unique take on the podcast app. While the podcast space is getting fairly crowded these days, there’s no such thing as the perfect app — choice is good for everyone. 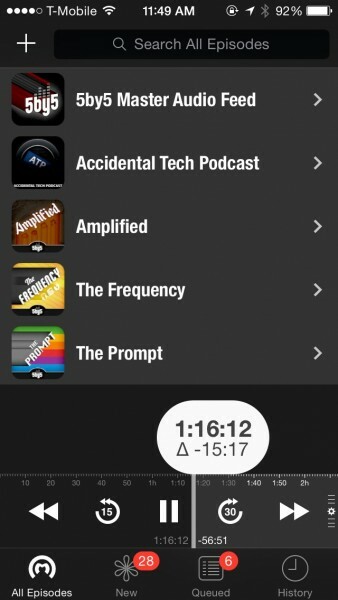 If the other apps just aren’t enough for your podcast needs, then this one is worth a look. 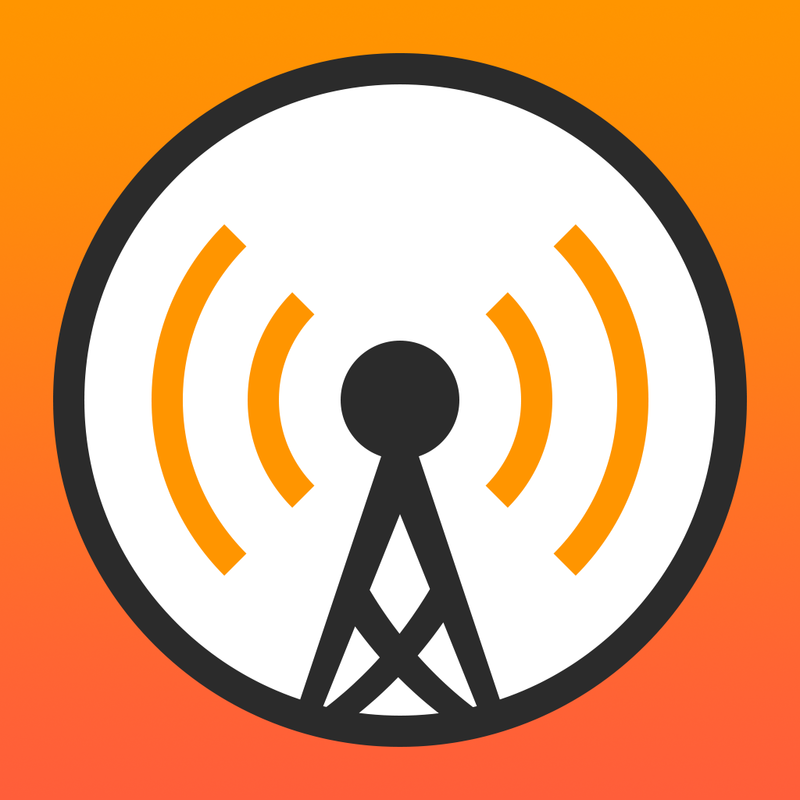 Mocast joins the App Store with other apps like Overcast, Downcast, Instacast, Pocket Casts, Castro, and even Apple’s own app. I’m a bit of a podcast junkie. They are one of my biggest forms of entertainment, as they are always filled with useful information, insights, discussion, and even laughs. 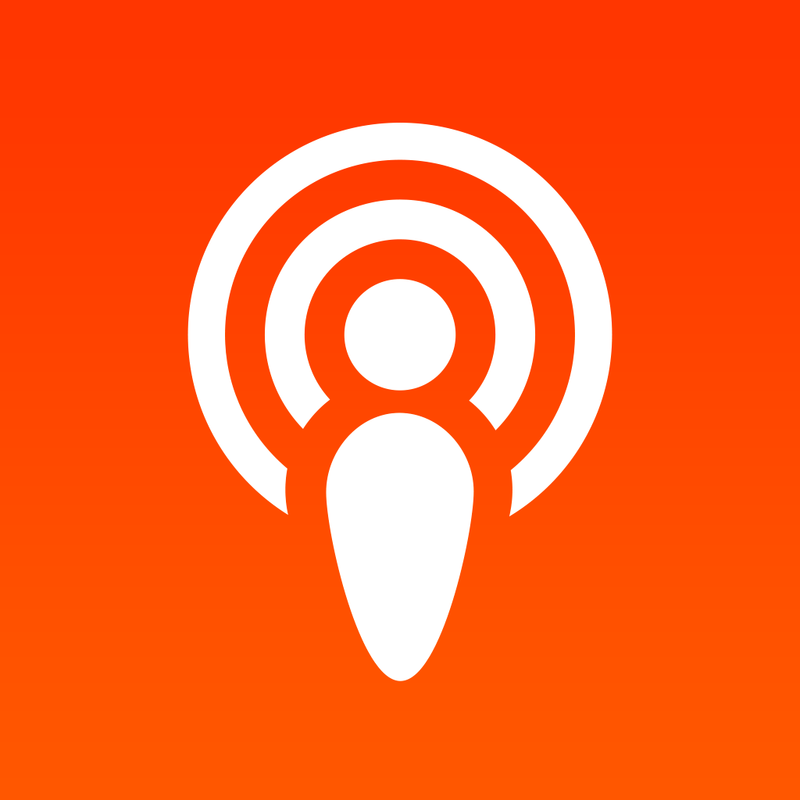 I’ve gone through and used pretty much every other podcast app available, and while Pocket Casts was my app of choice for months, I recently switched to Overcast for the time being (the only thing it’s missing for me is streaming). However, with all of the eyes on Overcast last week, it seems that Mocast got lost in the flurry. Fortunately, I caught some people talking about it, and decided to check it out for myself. Since I prefer simple and clean interfaces for my podcast apps, I was a bit surprised and caught off guard with how Mocast looks. It’s definitely different from what I’m used to, and it took me a while to adjust. 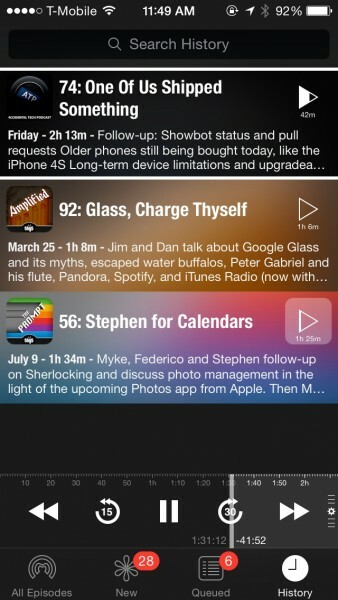 Mocast has a dark interface, which is a bit of a change, as most other podcast apps feature a light color scheme. It’s also a bit more cluttered, as it features a navigational tab bar at the bottom of the screen as well as playback buttons on top of it, even if you aren’t playing an episode. I’m not fond of how this looks, but it may not be a big deal for others, because the functionality is there. 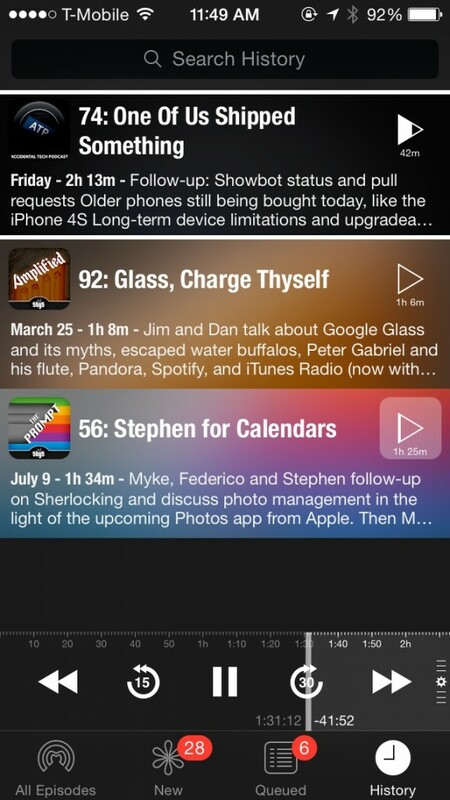 Mocast has four sections in the bottom tab bar, and you can add podcasts from the “All Episodes” view. Now, the thing that annoyed me with Mocast was the fact that there is no import feature. This means that if you have a lot of subscriptions in other apps, you’re going to have to re-add them all one-by-one in Mocast — the developer should consider adding OPML import functionality in the future. 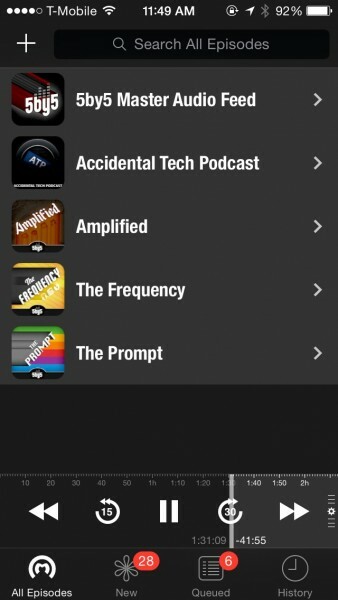 To add a podcast, you tap on the “+” button from the All Episodes tab. Another thing that bothered me here was the fact that there is only a text field to search for the shows you want. You can also plug in a URL here and it will get the subscription feed. 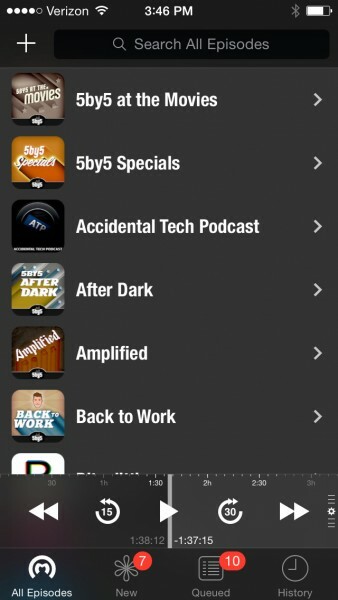 Unlike other apps, there is no type of directory or recommendations for discovering new podcasts. 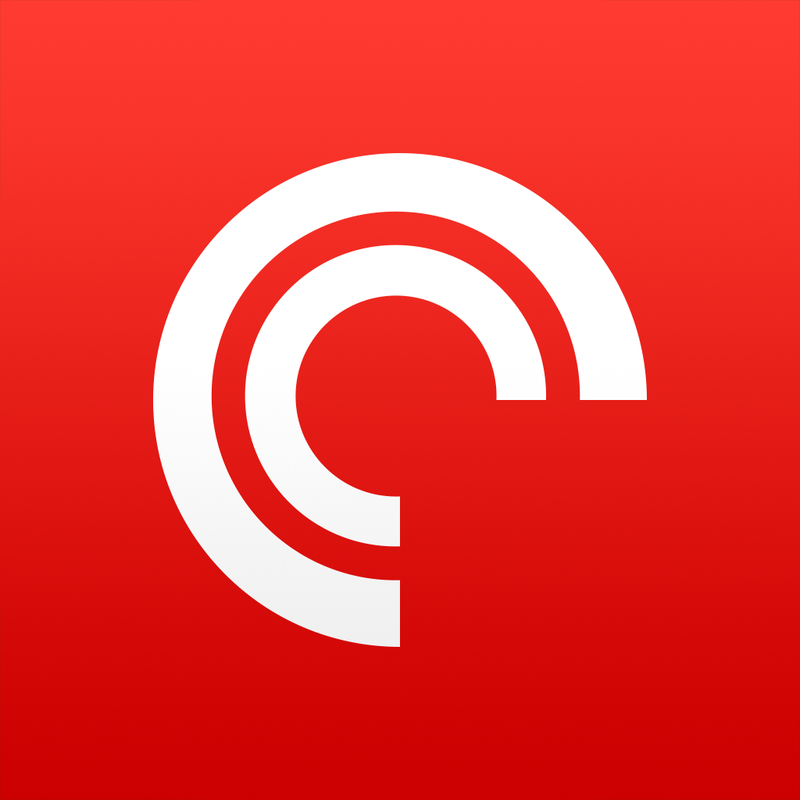 With Mocast, it seems to only focus on what you are already familiar with — it would have been nice to have a directory and featured shows, but perhaps another app will be a better choice for that if it’s a necessity. Once you find the show you are looking for, tapping on it will automatically subscribe you to it. You should also find an episode list of recent and old episodes, but sometimes this appeared blank for me unless I manually refreshed it right away. You can go back and view your other subscriptions and their episode lists by swiping to go back or tap on the back button. A unique thing with Mocast’s interface is the fact that the list of episodes features a cool blurred, parallax effect of the podcast artwork in each “episode bar,” which has the episode name and an excerpt of the show notes. It is a nice touch, and it looks fun when you’re looking at the “New” or “Queued” sections. 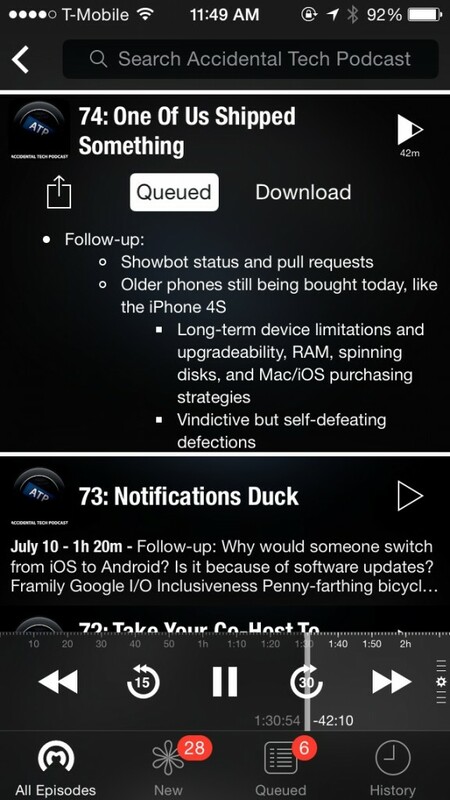 Tapping on an episode will expand the show notes, and you have three actions you can do: share (with the native Share Sheet), queue, or download the episode. A tap on the play button will start streaming it if it’s not already downloaded. 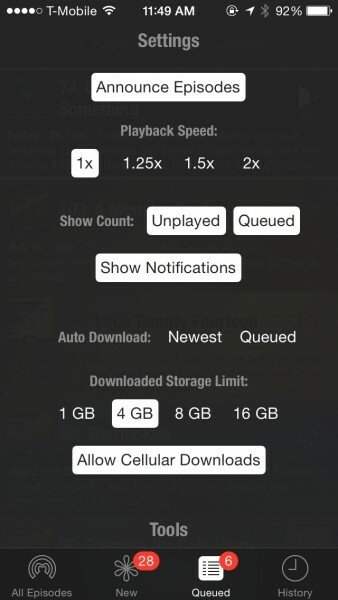 By default, Mocast downloads newest and queued episodes automatically. If you drag the handlebar on the playback bar up, you will reveal a panel that shows the Now Playing section, what’s coming up next, and then have several settings to tweak. 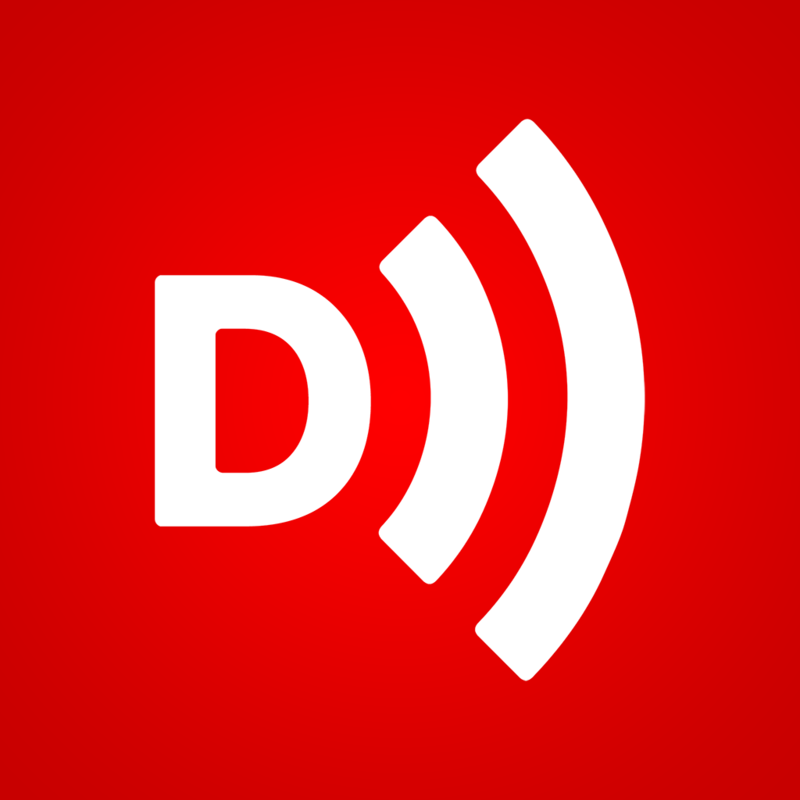 Mocast can announce episodes in a robotic voice (useful if you’re going through the queue), adjust the default playback speed (1x, 1.25x, 1.5x, and 2x), show count and notifications, toggle auto downloads, allow cellular downloads, set a download storage limit on your device, add a new podcast from here, or even delete all downloads at once. 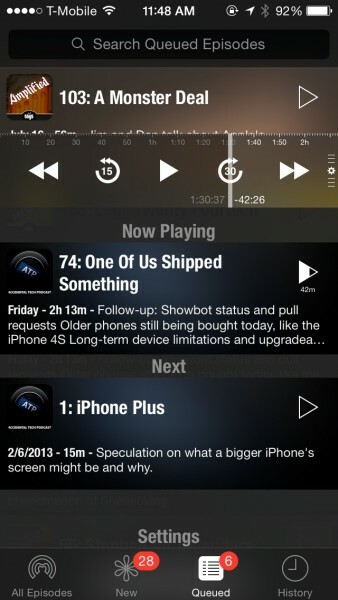 The playback bar, while a bit cluttered, has a bit more functionality than other apps. It comes with the standard playback buttons, including “previous” and “next” episode buttons, go back 15 seconds or jump forward 30 seconds (non-changeable), and play/pause. However, the entire bar serves as the audio scrubber, and you can see how long the episode is along this bar (broken up into five or 10-minute intervals, depending on length). You can drag along this bar to jump to any point in the episode, and it even has a magnification feature so you can be precise. 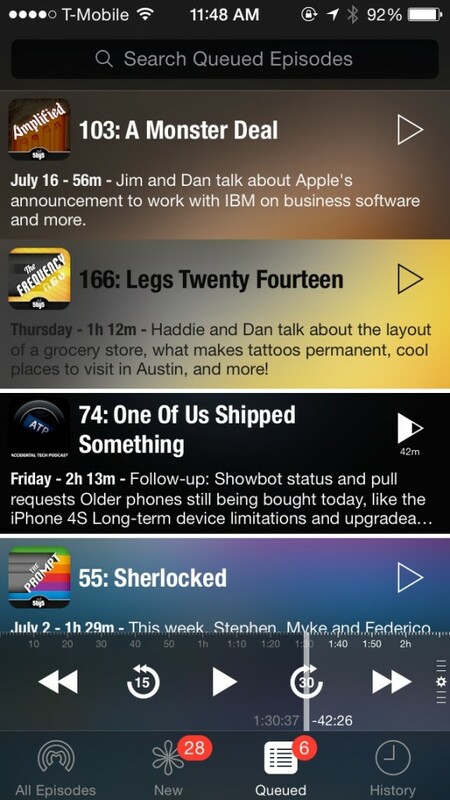 The queue serves as a playlist of sorts — you can queue up as many episodes as you want, and Mocast will play these queued episodes in the order that you added them in. A swipe right will reveal a button to move an episode to the top of the queue, and a swipe left can dequeue it. 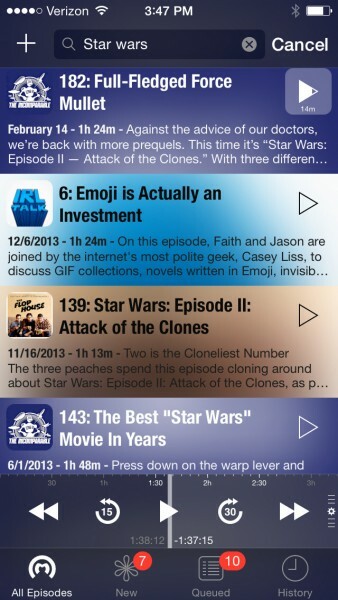 I wish that the app allowed you to reorder the episodes by drag-and-drop, though. 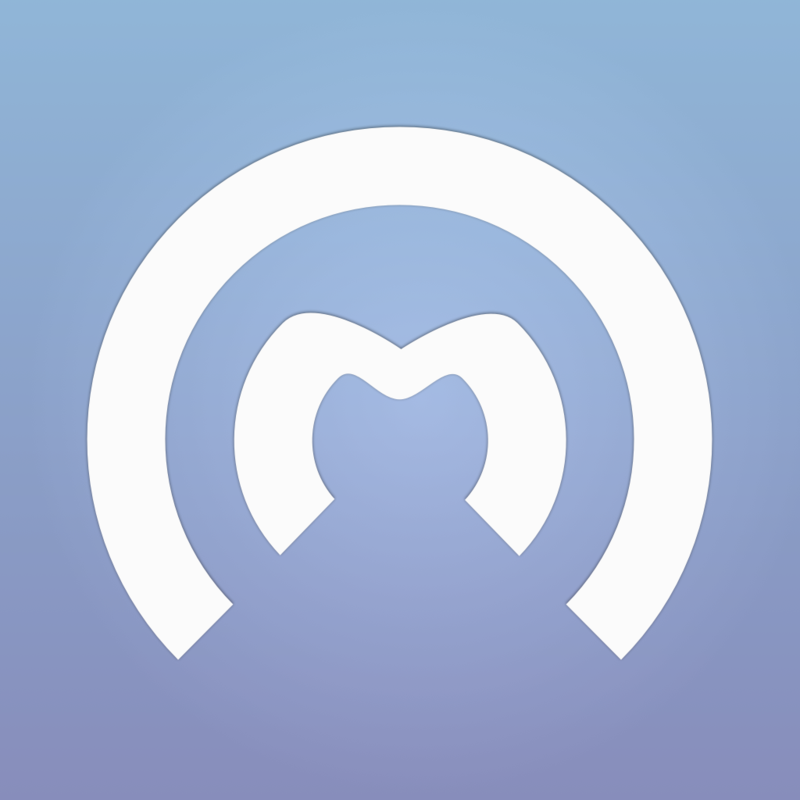 Mocast also keeps a record of what you have listened to, which you can find in the History tab. Your history will show both in-progress and listened-to episodes, so this is a nice reference. When you are viewing a show’s episode list, the New episodes view, or your Queue, there is one feature of Mocast that can make it incredibly useful for some: the search feature. 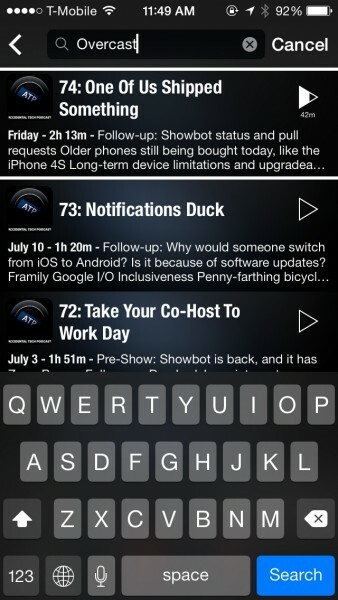 You can start typing in keywords in the text field, and Mocast will give you results in real-time, and it searches through all of the show notes, not just titles, which is practical. 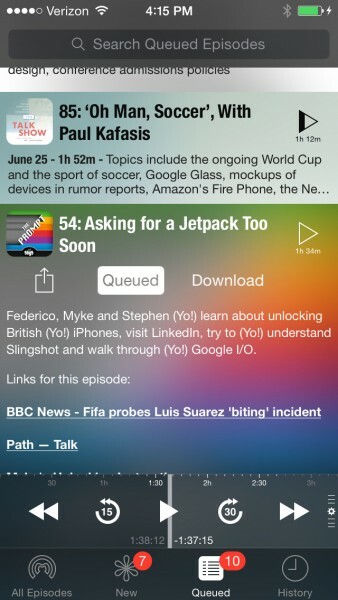 I like what Mocast has to offer, but I don’t think I will be switching to it as my default podcast app. The unique features it has are nice, though, and can be suitable for someone who has been wanting to search for a specific episode, have a record of what they’ve listened to, or have more precise control when scrubbing through the audio. 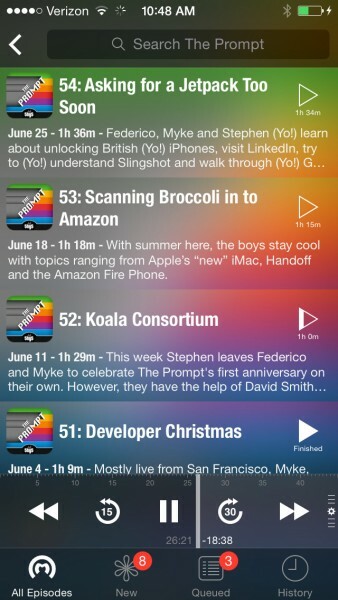 I just wish that it had a bit of podcast discovery included, or a way to import subscriptions from other apps. 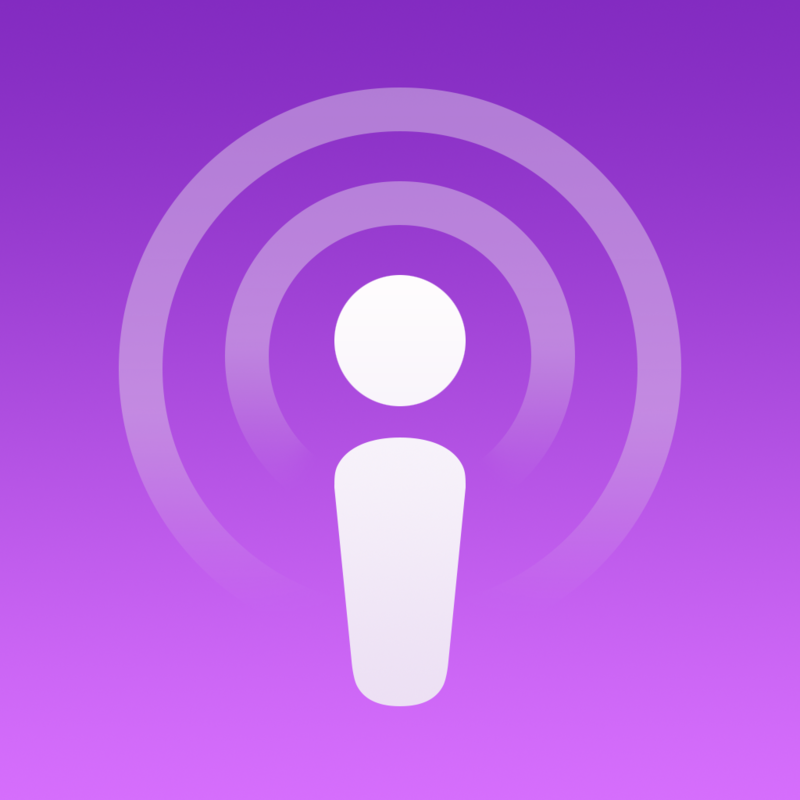 I recommend checking out Mocast for yourself, though, if you are not satisfied with the other podcast apps that are available at the moment. 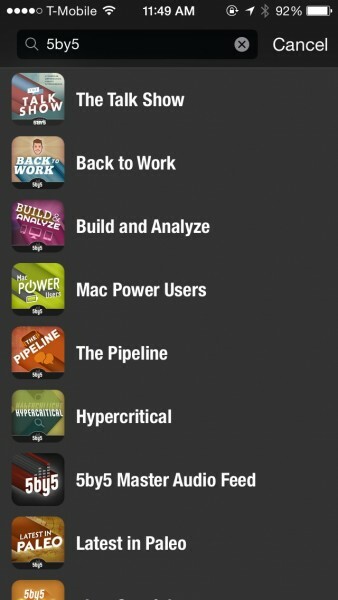 You can get it on the App Store for the iPhone for $2.99.